596 Acres is a public education project aimed at making communities aware of the land resources around them. With the goal of a food sovereign New York City in mind, 596 Acres is helping neighbors form connections to the vacant lots in their lives -- from the smallest (throwing a seedbomb) to the largest (hosting a public meeting with the head of a City Agency that owns a vacant lot that was promised to the community as a park, see myrtlepark.org). Thanks to the Center for the Study of Brooklyn, we have learned that many of these lots are actually publicly owned and are developing a platform for negotiating interim and long term community uses for this warehoused public space. 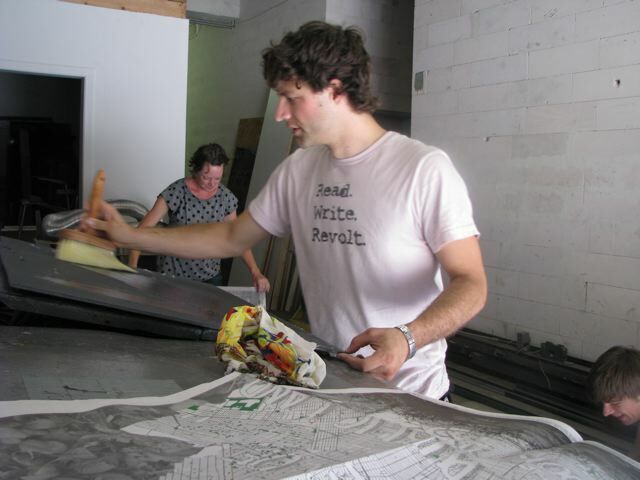 Maps will be distributed, with directories of where vacant public land is and who owns it to citizens and activists. They will also be afixed directly to the lots in question, with contact information of the owner agency. 596Acres will be available to consult with groups and individuals as they reach out to NYC government entities asking for control of space in their neighborhoods. New York City has a paucity of green space per person and the constant refrain is that there is not enough space here for all the awesome ideas that people have for how to "green" their neighborhoods and grow food. It turns out, the space is all around us -- especially concentrated in neighborhoods that need it most. 596 Acres is working to connect communities to the information they need to gain control of their environments. This is a great project. Keep it up! Thanks Edie! I have been talking with a few groups who have the capacity to fund their own projects and simply need SPACE. How should I direct their proposals? There is still an abundance of vacant public land in Brooklyn -- and in the other boroughs. -- 596 Acres is now on facebook! "Like" us here: https://www.facebook.com/596Acres. You might get to meet your neighbors this way, too! 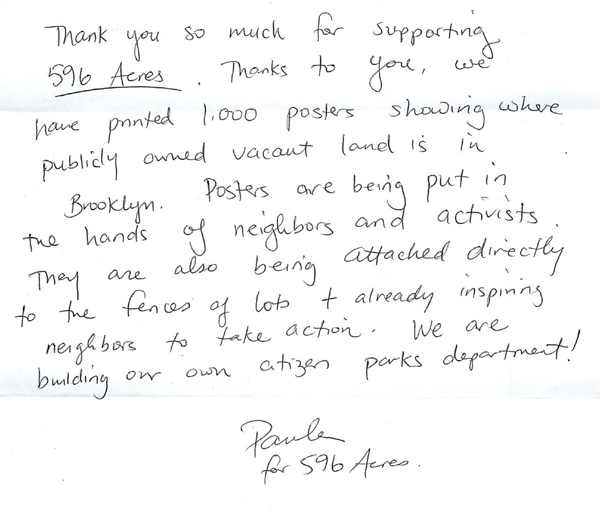 -- As a direct consequence of a 596 Acres map & placard posted at 59 Java Street in Greenpoint, there is a new Java Street Community Garden Coalition. Green Thumb and the Community Board are in the process of approving them for a license to start gardening this fall! Contact Stella Goodall <stella.goodall@gmail.com> to join your neighbors in this great project. -- The Myrtle Village Green got a promise from DEP to open up at least one-third of the 2-acre site this fall for a community garden and to support an inclusive planning process for the entire site for determining long term use. Lots of information is here: http://www.myrtlepark.org/ or on facebook: https://www.facebook.com/myrtle.village.green. MVG made the papers, too -- http://www.myrtlepark.org/category/announcements/press/ -- a great example of the power of organized neighbors. The next MVG meeting is coming up on July 28. Info here: http://www.myrtlepark.org/category/announcements/events/. You're invited! -- 596 Acres will be having a two-part visioning session to to think about next steps and how 596 Acres can best work to sustain itself (and me!) and support the awesome work that you are all doing towards an equitable, democratic, beautiful, food sovereign New York. I know that lots of you are visionaries on this list -- let me know if you can make it by RSVPing to 596acres@gmail.com! We will hopefully get some donated dinner. And I will have archival quality posters printed as gift for you. *****3 lots in a row on Myrtle Avenue between Marcy and Nostrand! Reply to this email if you want to get involved and I'll introduce you! -- An interactive online map of Brooklyn's vacant public land & community gardens is coming! Mapping vacant public land will help people identify resources, connect with each other, build neighborhood coalitions and reach the government owners most efficiently. Mapping the gardens -- which now appear as "vacant" land on official land use maps -- will let us see where we are succeeding and bring us a step closer to accurate use-coding of urban agriculture land and a new zoning classification. We are nearly done and would love some feedback if you have time to test it out. Let me know if you do and I'll send you the link to the super-secret site. -- 596 Acres was visited by the film crew of http://www.growingcitiesmovie.com/. What an honor! -- and coming up this fall -- nature tours! Thank you! 596 Acres of potential green space. See what 596 Acres has been up to! Interested in starting your own community garden or helping to spread the word? 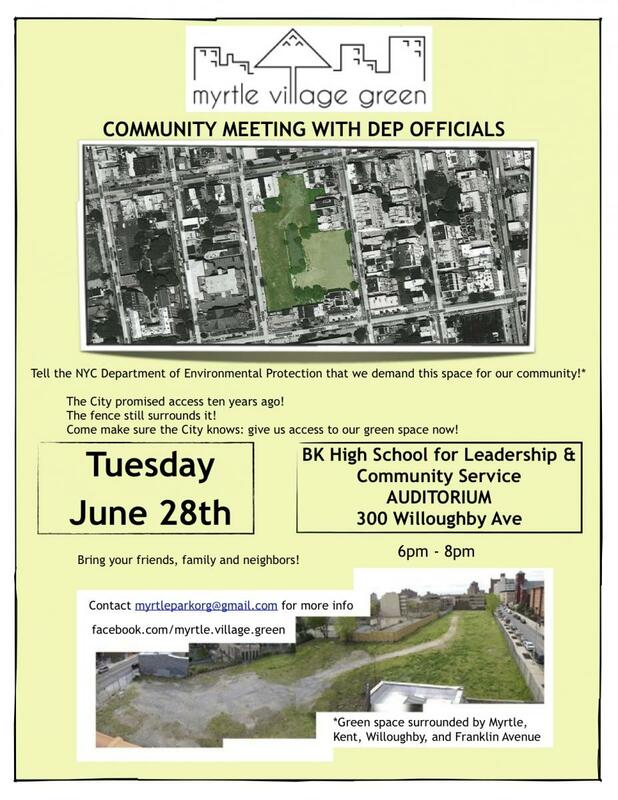 We are gearing up for a big neighborhood meeting to discuss the fate of green space in our neighborhood — specifically the history and future of 913 Kent Avenue, the Department of Environmental Protection-owned lot between Myrtle and Willoughby, Kent and Franklin. DEP Commissioner Caswell Holloway will join us to discuss the short and long-term future of the site. with City Council Member Letitia James and Democratic Committee Representative Lincoln Restler, representatives from the Brooklyn Food Coalition and the Kent Avenue Stabilization Taskforce, and you. Maps printed and ready! Pick up! The broadsheet map-directories have been printed. We have 1000 ready for distribution. Email 596acres@gmail.com to arrange to pick some up or if you have an infoshop, we'd love to drop them off. We need to build a distribution team. Tell us you want to be on it!